The collectors and leaders of the River Roundup team attentively listen to last minute directions prior to heading out to the rivers and streams of the Huron River Watershed. 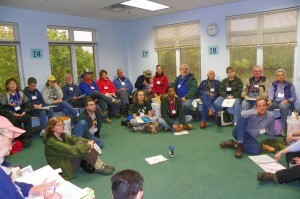 150 people gave the Huron River its six-month check up on Saturday, April 24. Families and other residents fanned out over the 900 square mile watershed to find indicator bugs in 58 sites on the river and its streams. Some were struck by the beauty of their surroundings, others were amazed at the numbers and variety of underwater bugs they found, and many enjoyed the comradery of team members, but all were proud of the work they were doing for the river. HRWC uses the resulting data to help watershed communities make decisions about how best to protect and restore the Huron. Our thanks go to all the volunteers who participated. River RoundUp is part of the Adopt-a-Stream program, which has been collecting indicator bugs to look at trends in the health of the Huron River watershed since 1992. The event happens twice a year, in the spring and fall. Volunteer with us for the October RoundUp and you too can give the Huron a check-up!